Maine mothers and their children visited the office of Senator Collins in Portland to deliver a crucial message to Maine’s Senior Senator: No mother in this country should have to worry about having her family torn apart by our broken immigration system. 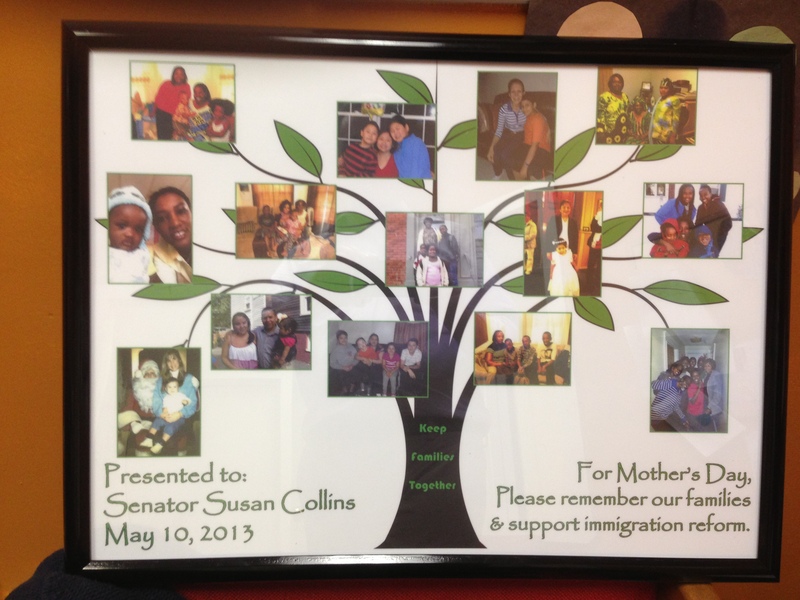 The mothers, representing a mix of Maine’s immigrant and native communities, delivered a framed photo collage of Maine families to serve as a reminder that families and their basic human rights should remain at the heart of the immigration debate. “We know that there will be lots of politics in the back and forth over immigration reform and what’s in the bill, but we, as women and as mothers, want Senator Collins to have this photo to remind her of what really matters in this debate — keeping families together,” said Mia Ntahobari of Portland. This week, the Senate Judiciary Committee began to take up portions of a comprehensive immigration bill proposed by a bipartisan gang of eight Senators. Senators Collins and King will play important roles in the debate, and Senator King has already taking a public stance in favor of immigration reform. A large coalition of allied organizations, include national labor groups and the US Chamber of Commerce, two groups commonly at odds on reform, have agreed in principle to substantial elements of the proposed legislation. “If we want to truly reform our system, this legislation needs to respect basic human rights, keep families together, and bring millions of Americans-in-waiting out from the shadows and provide a roadmap to citizenship,” said Alain Nahimana, immigration and racial justice organizer for the Maine People's Alliance. “The time is now to pass real, meaningful immigration reform, but it’s up to Maine’s Senators to help bring this legislation across the finish line."